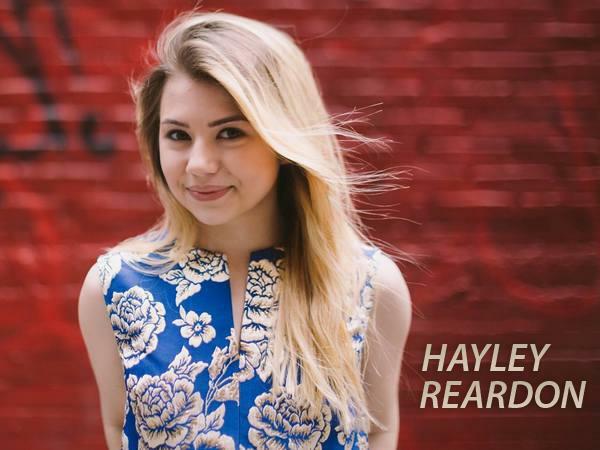 Join us this week as we welcome Folk Pop music singer songwriter, Hayley Reardon. Noted for her thoughtful, vivid songwriting and engaging stage performance, Hayley Reardon has spent the past six years sharing the stage with acts like Tom Rush, Peter Yarrow, Buskin & Batteau, Christine Lavin, and opening for the likes of Lori McKenna, Mark Erelli, and Catie Curtis. She has been selected for official showcases at Folk Alliance International and New England Regional Folk Alliance, as well as The Boston Folk Festival, New York Songwriter’s Circle, and Falcon Ridge Folk Festival Emerging Artist Showcase. In 2012, The Boston Globe Magazine named her a Bostonian of the Year for both her music and her work to pair it with a message of teen empowerment. The feature article characterized her as "a confident, radiant teenage singer songwriter who is helping to pen the next chapter of the Boston folk scene. With a voice that is distinctively rich and a contemplative sincerity in her songwriting, Reardon has far more in common with Patty Griffin or Lucinda Williams than many of today’s young pop singer/songwriters, boasting a lyrical and melodic weight far beyond her years. In exciting news for the fall of 2016, Hayley will be releasing her brand new album “Good" on October 28. We will talk to Hayley about her upcoming schedule, get a behind their scenes look at her music, feature her latest songs, and ask her to share her message for the troops. Please be sure to visit Hayley Reardon at http://www.hayleyreardon.com and spread the word. Fans are welcome to call in and speak live with her during the show (718) 766-4193. As always we will give shout outs to our deployed military listeners. Be sure to join us, 10/27/2016 at 8:30 PM EDT! Our message to the troops: WE do what we do, because YOU do what you do.